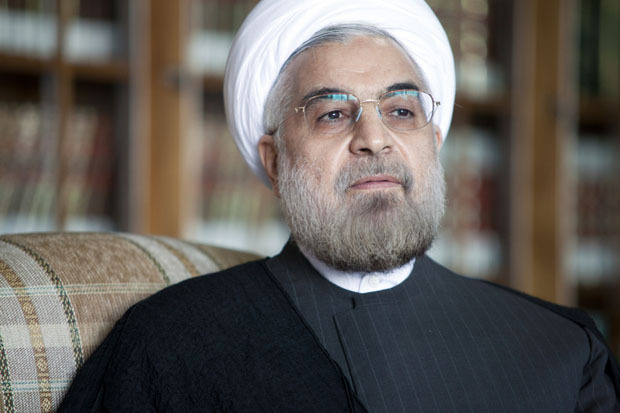 President Hassan Rouhani is fond of rhetorical flourishes that promise Iranians freer access to virtually all forms of information, from satellite television to uncensored books to a less tightly-regulated press. While in all of the aforementioned areas his policies have failed, or failed to exert themselves, there is one domain where the Rouhani government has pushed forward seriously: securing Iranians better and faster internet connections, including mobile internet that would enable them to properly use the smartphones they buy with such enthusiasm. In remarks to a group of clerics on Monday, Rouhani presented the internet as crucial to the nation’s progress in both science and academic research, areas that Supreme Leader Ali Khamenei has also identified as paramount to Iran’s development. “We cannot cannot close the gates of the world to our younger generation,” Rouhani said. Though Rouhani has backtracked on a number of cultural reforms in the face of fierce hardline opposition, he has been steadfast in backing his internet ideals with hard policies. In the past two weeks, the government has granted 3G and 4G licenses to the country’s two main mobile operators, and has in recent months also permitted internet providers to increase bandwidth on home connections. One reason why the president has been more willing to back the provision of higher speed internet is that so far, it has come at a more reasonable political price. Because service providers still implement government filters, the state censorship regime that prevents Iranians from accessing websites deemed “immoral” — everything from Facebook to many Persian news sites — will remain in place. While faster connections do mean that Iranians can more nimbly use proxy servers to get around the state filters, the speeds are still slow by developed world standards, requiring great patience from those wishing to use the internet to its full capacity. But 3G and mobile internet remain issues highly contested by hardliners made nervous by the challenges of filtering mobile devices. Grand Ayatollah Nasser Makaram Shirazi last week issued a fatwa declaring high-speed and mobile internet haram, later comparing mobile internet to “muddy water” that requires filtering. Rouhani has sought to bypass these concerns by making the case for the internet’s importance as a research tool for scientific progress. As Rouhani joked in an 30 August press conference, the speeds that the country’s clerics are advocating are slow enough to make someone waiting to download an article fall asleep. This framing of the issue is a canny approach, for it challenge Khamenei to back up his ardent support for Iranian scientific empowerment with policies that might otherwise make him uncomfortable. This past July at a meeting with university professors, Khamenei praised the work of the country’s “scientific movement”, saying that it “has achieved great objectives and become recognised on the international scene”. By linking the objectives most dear to Khamenei to his own objective of pulling Iran out of the internet dark age, Rouhani is carving out a political space where his goals are seen to overlap with those of the supreme leader. When the Committee for Determining Criminal Web Content sought to block access to the popular mobile messaging tool WhatsApp, Rouhani intervened. While this certainly endeared him to young Iranians who used the messaging service widely, Rouhani also risked riling the National Telecommunications Company, which is losing revenue as Iranians turn to cheaper foreign alternatives for messaging. In the battle over control of the internet, there are multiple institutions across political factions vying for a role, with the competing financial interests of various mobile, 3G and telecoms providers underlaying the fray. But what’s clear is that Rouhani has chosen the internet as one of the rare areas where he will back rhetoric with clear policy. Azadeh Moaveni is a former Middle East correspondent for Time magazine, lecturer in journalism at Kingston University, and author of two books on Iran.